Soon after I reviewed the documentary Jean-Michel Basquiat: The Radiant Child and revised my usual skepticism about modern art watching that portrait of the late artist whose career began in graffiti, here comes the hilarious Exit Through the Gift Shop which makes me think those who embrace it are pretentious suckers once again and the famed street artist Banksy is the director who made the film. It's almost as if he's saying, "Smile, you're on Candid Camera" to the whole world (or, for you youngsters, a whole lot of people just got Punk'd). 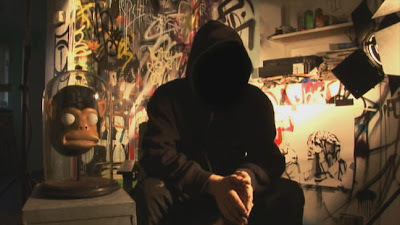 The documentary, and I use the term loosely, begins as an eccentric Frenchman named Thierry Guetta sets out to make a film about the phenomenon of street art, following and interviewing such artists as Shepard Fairey, who gained fame for his Barack Obama art and the lawsuit by The Associated Press accusing him of using its copyrighted photograph for his work. Guetta follows many artists and travels extensively but he has a big target in mine: the reclusive street art superstar Banksy. Because many of the places where Banksy displays his work he does so without permission, he does his best to stay in the shadows to live a life of anonymity to avoid arrest. However, he eventually hooks up with Guetta and, though he helps him make a narrow escape from the Disney police, Banksy does come to realize that something is off about Guetta. What Banksy doesn't even know at that point is that Guetta knows nothing about filmmaking and has no intention of making one. He has boxes full of unmarked videotape, so when Banksy asks to see how the film is coming, Guetta rushes to haphazardly assemble bits and pieces of tape without any rhyme or reason. Eager to get Guetta to go away after sitting through the unwatchable mess, Banksy half-jokingly suggests that Guetta try his hand at art while he keeps the unedited footage and sees what he can do with it. The joke ends up being on the entire art world as Guetta rechristens himself MBW (short for Mr. Brainwash) and promotes himself to a massively hyped show in L.A. where his silliness, much the work of people he hired to help him, starts selling for big prices and he becomes the hot new name in art. It's hysterical to watch people waiting in line to see his show so convinced of the greatness that awaits them inside. It's really hard to take any of the art seriously when you've seen who Guetta was before and how the exhibit came together. To think that Banksy, who apparently does have some real talent, would be so willing to help make a film that shows how shallow and silly the people who judge, frequent and collect modern art can be takes some big balls, but who cares? It makes for a damn entertaining film that's funnier than most scripted comedies. In everything I've seen written about the film, I'm surprised few have brought up the implications in "Exit" that the validity of all audience and critical reaction to any work of art should be challenged and questioned, considering how easily people in this movie saw Mr. Brainwash as the Next Big Thing, not unlike Banksy's own show earlier in the film attended by celebrities and people wanting to latch onto whatever they think will be christened hip. I also think some misunderstood the ending as just about Banksy casting himself as a more legitimate artist than Brainwash, as much as it was about him contemplating that the public and critical reaction to his own work was borne of something equally phony as the reaction that Brainwash received, regardless of the talent displayed. Or, perhaps, this all hit a bit too close to home, as many film critics today engage in this shallow posturing whenever they praise a film as the second coming or tearing something down as representative as all that's wrong with cinema. That's a discussion I wish the film had inspired more when it came out.